Our team of security experts at Alfa Lock Service have experience working with a wide range of both domestic and foreign automobile manufacturers including, Toyota, Honda, Nissan, Lexus, Hyundai, Chevrolet, GMC, Ford, Chrysler, Dodge, and more. 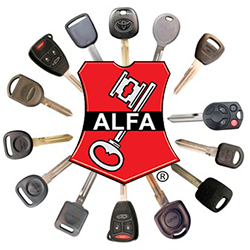 Alfa Lock Service has been helping offers helping vehicle owners with their automotive security needs, since 1980. Whether you’ve been locked out of your car or need a new transponder key made for your car, our professional locksmiths are fully equipped with a variety of special tools to safely open your vehicle. Call us today at 305-598-3628 to learn more about our automotive services, or come visit us at our showroom on Galloway Road. You can also fill out the short form on our Contact Us page and one of our staff members will contact you.